Tonight on Off The Hour, Tuesday November 13 at 17h for the story of political prisoner Lynne Stewart who has now been behind bars for over three years! Lynne Stewart was originally sentenced to 28 months, only to be re-sentenced and is now in prison with a 10 year sentence. This summer Lynne lost her appeal. She is also now battling cancer and hence has two battles to overcome. 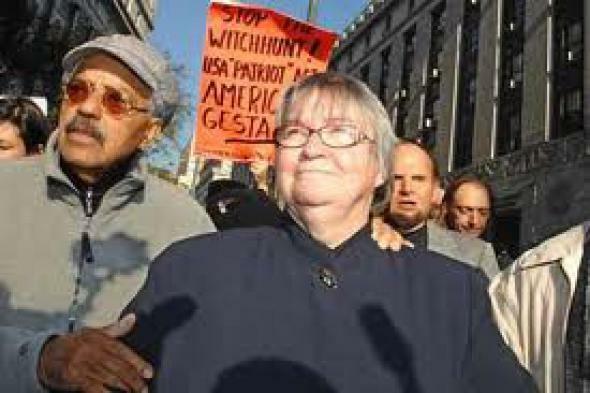 To find out more about who is Lynne, what is involved in her case and the concerted attack on the American justice system, we have an interview with activist Ralph Poynter, Lynne Stewart’s husband. This travesty of justice has even hit home here in Quebec, where a documentary titled Lynne Stewart: An American Story is in its final stages of completion.We also have an interview with writer Claude Herdhuin, who worked on this documentary which will air in the early part of 2012 on Radio-Canada. Photo of Lynne Stewart accompanied by her husband, Ralph Poynter, at a demonstration.